Power Curber owner Jay Shorette of Dirigo Slipform in Stillwater, Maine, was recently honored as Concrete Promoter of the Year for 2013 by the Northern New England Concrete Promotion Association (NNECPA). This award recognizes Jay’s contributions to the concrete industry through his tireless efforts to educate and inform about slipforming. 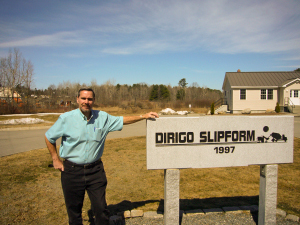 Jay has visited customers and offered lunch box presentations about slipform curbing, and has hosted numerous educational programs at Dirigo’s offices, including seminars and certification programs. 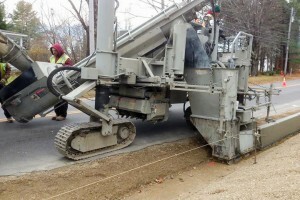 Jay has long been a huge proponent of slipforming, nearly single-handedly taking Maine from a zero slipform state to pouring several hundred thousand feet per year statewide. Dirigo Slipform, Jay’s company, has also won numerous awards, including Best Concrete Construction Project from the NNECPA for the past nine consecutive years. They have also been recognized with three safety awards from The Associated General Contractors of America and have received recognition from the VFW, YMCA, and Habitat for Humanity for their contributions to their local community.